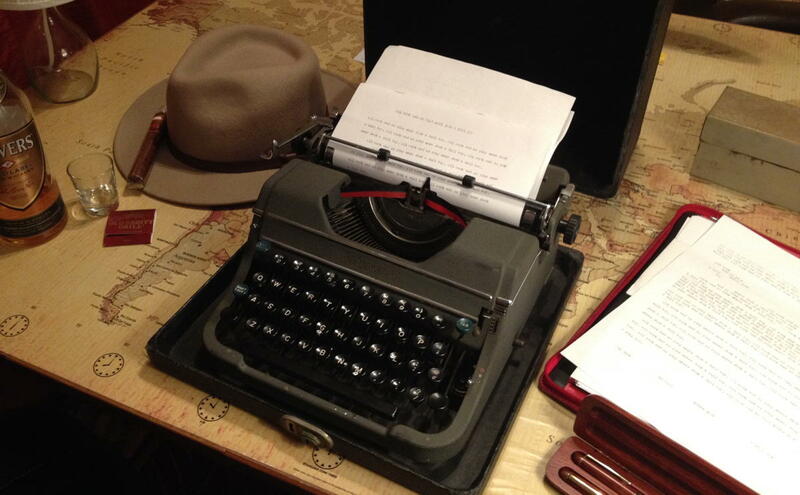 Beware: typewriters are a gateway drug into whiskey-drinking, cigar-smoking, and fedora-wearing. The typewriter is one of two mass inventions that made the modern age. Without the typewriter there is no personal computer. And the typewriter in its day meant clear and readable, precise communication between individuals. It also meant the modern novel and the modern author, who writes books by the sheet and box-load. The typewriter meant mass-producing authors and not just books. In this way, the typewriter also created the modern reader, by making it possible to stock large bookstores. If I had my choice, I wrote six years ago, I’d get a typewriter that looked like the Underwood No. 5. It looks vaguely like one of those over-cerebral aliens with huge foreheads. It leaves no question that it’s a serious machine. A little over a year ago, browsing through the San Diego swap meet, I met a different Underwood, a portable Champion. It’s much sleeker than the No. 5 and I immediately began revisiting what I really wanted in a typewriter. I had envisioned the No. 5 as more of a decoration than a tool, but the Champion looked like something I might actually use. By the time I finished wandering the swap meet, I had decided to try: I offered the dealer a much lower amount than the asking price, in cash, and walked out with my first, and still only, typewriter. So I’m a little surprised at how useful this manual typewriter has been. I often lose great ideas because I have them at night and I’m too lazy to get up, or if I’m not too lazy to get up, by the time I get the computer turned on, or find my pen and an empty space in my notebook, I’ve forgotten half the idea, and usually the good half. With the typewriter, I just flip the top open and insert some paper, and I’m ready to go. Nor are there, knock on wood, ever any of those recursive problems that come up when one thing goes wrong, and trying to quickly fix it I discover something else that’s wrong, and so on. When I open the typewriter lid, it doesn’t matter if I have Internet. It doesn’t even matter if I have power. There’s a big subculture among writers that touts “focused writing” or “distraction-free writing” apps that only show what you’re currently working on. One of the reasons I use Nisus Writer as my word processor is that it gets in the way of writing the least of all word processors I’ve looked at. For quick entry, I currently use iA Writer regularly on both my iMac and iPad, as well as Editorial on my iPad. But a typewriter is the ultimate focused and distraction-free app. Psychologically, it’s a very nice feeling to tear out a completed page and insert a fresh page to continue an unfinished sentence. I’ve finished more short stories in the last few months since starting to use the typewriter for writing, then I have since leaving college. My Underwood Champion is from about 1946. I don’t have a manual for it, and, surprisingly, these are not user-friendly machines. While it’s obvious where the letters are, it is not so obvious how to control line spacing, or the direction the ribbon travels. And some of the things that aren’t obvious, it isn’t even obvious that you’d want to do that. Sometimes even the existence of features is unobvious. I found the manual for an earlier but similar Underwood, the Underwood Standard from about 1929, at Machines of Loving Grace, and it helped immensely—I learned how to go beyond the margins, for example, which I didn’t even know I could do. But that model lacks some features my model has, such as tabs. I think that the Champion has one tab stop, and mine might be worn out. But it also could be that I just don’t know how to use it. One of the hardest things to get used to on this typewriter is also the most disciplining: there is no exclamation point on this typewriter, and no reasonable way of simulating one. If I absolutely have to have an exclamation point I can sort of get one by using an apostrophe, backspacing, and a period, but it doesn’t look right. So I avoid using exclamations and, instead, try harder to get emphasis across in the text. When I bring it over to the computer, I may put in some exclamations (or italics), but it’s a good exercise to avoid them at first. Another quirk common to older typewriters is the lack of a numeral “1”. The lowercase “l” doubles as the numeral on my typewriter. It’s new enough, however, that it has a separate “O” and “0”. And there is no equal sign (=) or plus sign (+), though there is a quarter symbol, a half symbol, a dollar sign and a cent symbol—which, I’ve just discovered, is missing on my iPad’s software keyboard. It does have a minus, though that’s probably for a dash, and it has a slash. The comma and period are the same shifted and unshifted. Another disciplining feature is that letters must be typed discretely. That is, separately and individually. A computer keyboard doesn’t care if one letter is typed a millisecond after another; a mechanical keyboard does. Type two keys at basically the same time and they’ll both go up. But there isn’t room for two physical keys in the same space, so they’ll hit each other and often get tangled. Each key must be hit discretely and with quiet strength. It’s like Tai Chi for writing. In response to The odd expectations of typewriter users: People who buy typewriters fall into two camps: those who want them to be like computers, and those who don’t recognize computers when they talk directly in their ear. Like Jack and his beanstalk, I saved up money and went to a local hamfest to purchase a word processor. Back then, hamfests were as much computer festivals as Amateur Radio festivals, Amateur Radio being filled with technology’s early adopters. However, I ended up buying a Space Invaders knock-off. My thought was, it would be easier to write a word processor in BASIC than to write Space Invaders in BASIC. My home-brew word processor was unique, to say the least, but it did the job until I went to college and pirated Scripsit from the TRS-80 owners next door. I took that course because I expected (for once, correctly) that (a) computers would become ubiquitous, and (b) that they would retain the keyboard as the most efficient means of using them for a long time. Half-inch black and red ink spool for most typewriters. People who buy typewriters fall into two camps: those who want them to be like computers, and those who don’t recognize computers when they talk directly in their ear. Discretely and with quiet strength: the Underwood Champion Portable last modified February 7th, 2017.